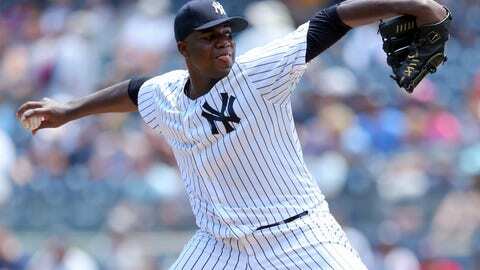 — Pineda had to have Tommy John surgery after partially tearing his ulnar collateral ligament (UCL) in his right elbow. No one seems to know when Pineda originally was injured in 2017, but in his first 12 starts (April 5-June 8) he had a 3.39 ERA and held opponents to a .235 batting average. In his final five starts (June 14-July 5), he had a 7.30 ERA and opponents batted .351 against him. — Minnesota gave Pineda a two-year, $10 million contract ($2 million in 2018 and $8 million for 2019). That deal came days after the Cubs gave Drew Smyly, who is not expected to pitch in 2018, a, you guessed it, two-year, $10 million contract (although Smyly will get $3 million in ’18 and $7 million in ’19). — Pineda was signed out of the Dominican Republic at the age of 16 for $35,000. He is from the town of Yaguate. His school did not offer English as a subject. — Pineda spoke only Spanish until he made it to the major leagues. However, he learned English by talking with teammates who only spoke the language (and not Spanish) and has insisted on carrying out interviews with reporters without the help of a translator. — According to baseball-reference.com, Pineda is one of 10 pitchers all-time to stand at least 6-foot-7 and weigh 260+ pounds. Former Twins reliever Jon Rauch (2009-10) is also among the 10. Pineda is listed at 6-7, 260. — At the age of 17, Pineda made his pro debut with Seattle’s Dominican League summer team and allowed just four runs (one earned) on 14 hits in 20 1/3 innings. — It didn’t take long for Pineda to emerge as a top prospect in the Mariners’ system. After the 2008 season, when he was just 19, Baseball America ranked him the No. 10 prospect in the organization. Two years later, he was up to No. 2 as well as the No. 16 prospect in all of baseball as well as the No. 3 prospect in both the Southern League and Pacific Coast League, where had split his time that year. — Baseball America also tabbed him as having the best control (2008-09), best fastball (2009-10) and best slider (2010) in the Mariners’ system, as well as the best fastball and best pitching prospect in the Southern League (2010). — Pineda made his major-league debut on April 5, 2011 for Seattle, striking out the first batter he faced, Texas’ Ian Kinsler. — In his rookie year, Pineda allowed just 133 hits in 171 innings while striking out 173 and posting a 3.74 ERA. He was named to the All-Star Game as a replacement for Justin Verlander and tossed one inning of perfect relief, striking out two. — After finishing fifth in the AL’s Rookie of the Year voting, Pineda was packaged in a deal in January 2012, sent to the Yankees, who included catching prospect Jesus Montero in return. — Pineda wouldn’t make his debut with New York until 2014. In 2012, he had to have shoulder surgery and then suffered another shoulder injury while rehabbing it. He spent 2013 in the minors after coming off the disabled list in July. — On May 10, 2015, Pineda struck out 16 batters — tied for second-most in Yankees history — in just seven innings against Baltimore while walking none. It was the first time in eight years (Johan Santana, 2007) that someone in MLB had a 16 strikeouts and no walks in a game. — He set a Yankees single-season record for a starting pitcher in 2016 with a K/9 rate of 10.6. — Hey, Pineda has a pretty good history against AL Central teams. In 10 starts vs. the Royals, he has a 3.84 ERA, 1.105 WHIP and 8.1 K/9. Against the White Sox he has a 3.60 ERA, 1.080 WIHP and 7.9 K/9 in four starts and vs. the Tigers a 3,91 ERA and 11.3 K/9, also in four starts. Pineda has faced the Indians just once, winning a game in which he went six innings, allowing four runs on six hits and one walk while fanning six.